Hurricane Irma has strengthened to a Category 5 storm, and catastrophic damage is possible in the Florida Keys and southern Florida this weekend as a second storm has formed behind it. Add Irma as an interest to stay up to date on the latest Irma news, video, and analysis from ABC News. Irma was packing 185 mph winds and gusts of more than 200 mph as of 2 a.m. ET Wednesday, and is expected to continue churning with deadly hurricane-force winds and a dangerous storm surge across a wide swath of the Caribbean this week before moving toward southern Florida, according to the National Hurricane Center (NHC). The dangerous storm made landfall in Barbuda around 2 a.m. on Wednesday and is moving west-northwest at 15 mph. Hurricane watches and warnings have been issued across Puerto Rico, the Dominican Republic, Haiti, Turks and Caicos, Cuba and the Leeward Islands. Meanwhile, Tropical Storm Jose has formed over the open Atlantic, following closely behind Irma, the NHC said Tuesday. Jose could become a Category 2 hurricane as it brushes the northeastern-most Caribbean islands at the end of the week. 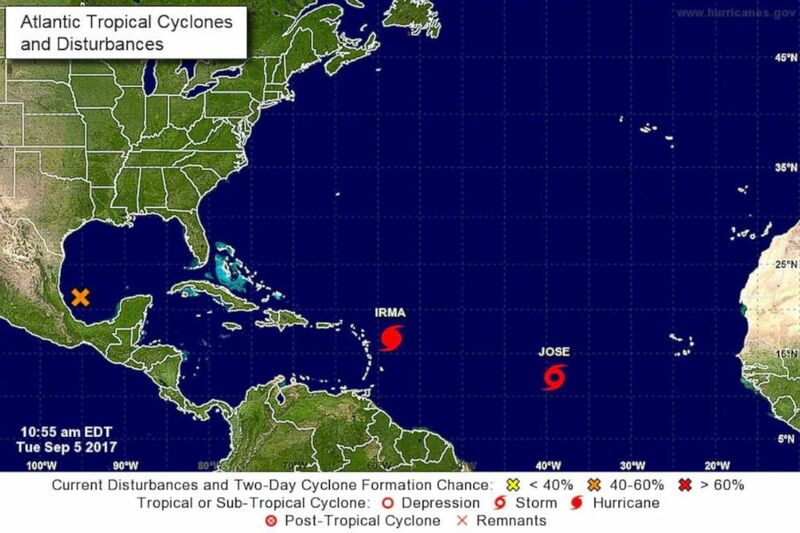 However, Jose poses no threat to the U.S. or Puerto Rico as of Tuesday. The NHC warned that residents in the Leeward Islands, already expected to face Irma, "should monitor the track" of Jose. A graphic from the National Hurricane Center shows Tropical Storm Jose forming behind Hurricane Irma, Sept. 5, 2017. The NHC on Tuesday called Irma the strongest hurricane in the Atlantic basin outside of the Caribbean Sea and Gulf of Mexico in NHC records. 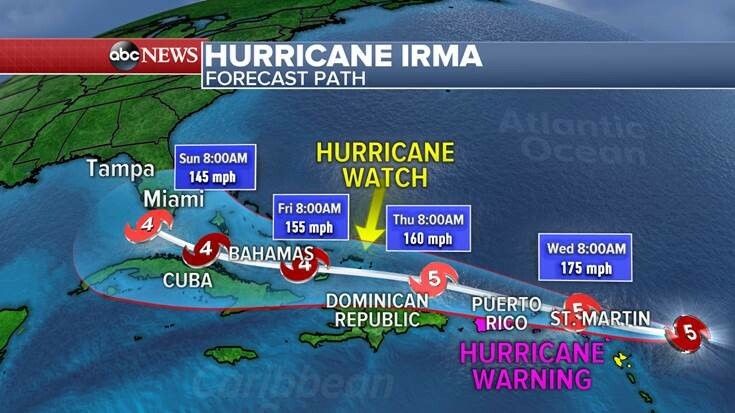 By Sunday around 8 a.m., outer bands from Hurricane Irma are expected to reach the Florida Keys with winds of 145 mph as a Category 4 hurricane. Irma's center is forecast to move over Key West on Sunday afternoon. PHOTO: An ABC News graphic shows the hurricane Irma forecast path as of Sept. 5, 2017. It is still unclear whether the storm will track up the east or west coast of Florida. If Irma travels up Florida's west coast, it would present worst-case scenarios for Gulf cities from Naples to Tampa. If the storm travels up Florida's east coast, the "bad" side of the storm would remain off-shore, but it could later make landfall somewhere between Savannah, Georgia, and Charleston, South Carolina. Florida Gov. Rick Scott on Monday declared a state of emergency for every county to ensure that local governments have enough "time, resources and flexibility to get prepared for this dangerous storm," according to a statement from his office. Mandatory evacuation orders have been ordered for Monroe County, which includes the Florida Keys, beginning on Wednesday, but cars were already streaming out of the region on Tuesday evening. Officials also anticipate evacuation orders for low-lying portions of Miami-Dade County, including Miami Beach, by late Wednesday or early Thursday. President Donald Trump approved Scott's declaration for a pre-landfall emergency for the entire state of Florida, the governor said in a press conference Tuesday evening. Scott said Tuesday that it is important that Floridians keep a close eye on the storm and "do not sit and wait to prepare." Scott has deployed 100 members of the Florida National Guard, and nearly 7,000 troops will be reporting for duty in the coming days, the governor said. The American Red Cross is sending 1,000 volunteers to Florida, Scott said. "In Florida, we always prepare for the worst and hope for the best," Scott said, "and while the exact path of Irma is not absolutely known at this time, we cannot afford to not be prepared." Wes and Davina Hardin of Palm Bay are buying plywood and other hurricane supplies in preparation for Hurricane Irma on Sept. 4, 2017, at the Melbourne Lowe's Home Improvement Store on Minton Road, Fla. The Monroe County School District is shuttering schools Wednesday, the county added. Schools in several other Florida counties, including Miami-Dade and Broward, will be closed Thursday and Friday, Scott said. The University of Miami has canceled classes for Wednesday, Thursday and Friday, the school announced Tuesday. Scott said at this time there are no reported issues with availability for fuel and supplies, but he urged residents to only "take what you need." There were long lines for gas in many areas of south Florida on Tuesday. All 67 state offices will be closed Friday in preparation for the hurricane, Scott said, encouraging state employees to volunteer at local shelters. The Florida Keys experienced massive flooding from Hurricane Wilma in 2005, which was a Category 3 storm. The last Category 5 storm to make landfall in the Florida Keys was the Labor Day hurricane of 1935. A spokesperson for the Naval Air Station at Key West said a separate evacuation order has been issued for the base’s 5,500 personnel and their families, effective Tuesday at 8 p.m. The last time the base was evacuated was in September 2008 for Hurricane Ike. Broward County, Florida Mayor Barbara Sharief said Tuesday that Broward County will feel tropical storm-level winds by Friday. The mayor said those who live in an evacuation zone should plan to evacuate, adding that extra shelters will be available. Schools in Broward County will be closed Thursday and Friday. Category 5 is the strongest hurricane category on the Saffir-Simpson hurricane strength scale. In a Category 5 storm, winds reach more than 157 mph and damage is expected to be catastrophic, with buildings and roofs destroyed. The Carnival Cruise Line has diverted four ships carrying more than 13,000 passengers to maintain a "safe distance" from Irma, a spokesperson said. "The safety of our guests and team members is our first priority," the company said in a statement. "We will continue to make adjustments as necessary." 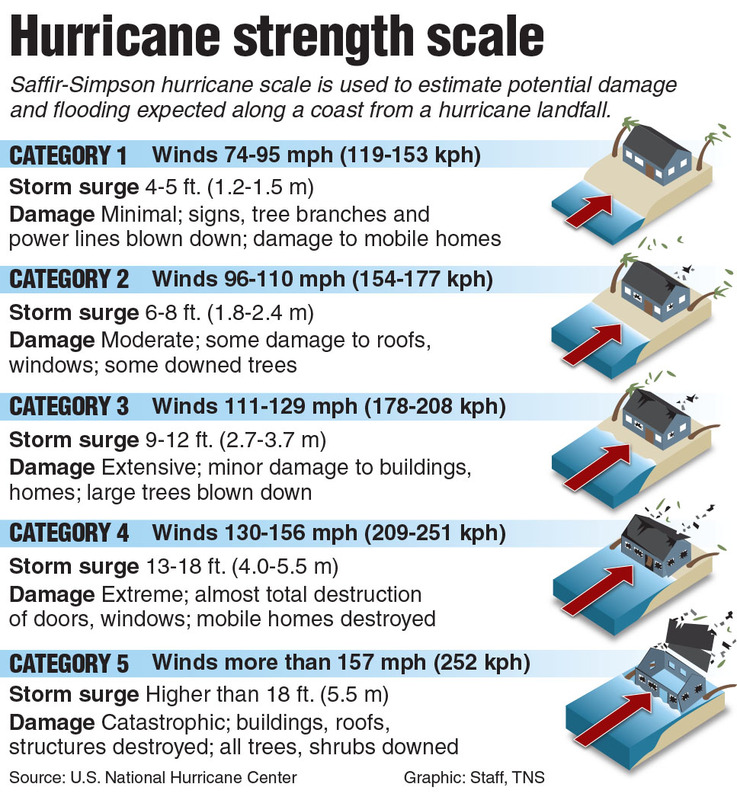 PHOTO: A graphic shows the relative strength and effects of hurricanes on the Saffir-Simpson scale. The current NHC storm track puts Irma near the Leeward Islands, including Antigua and Barbuda, on Tuesday. On the nearby island of Anguilla, which Irma is forecast to move over Wednesday morning, the Department of Disaster Management on Tuesday warned of flash floods and mudslides. Four shelters were scheduled to be opened as of Tuesday afternoon. The Virgin Islands and Puerto Rico are forecast to see deteriorating conditions throughout the day on Wednesday with the worst of the rain and wind arriving Wednesday night. The storm is expected to pass north of Puerto Rico Wednesday night into early Thursday morning. In Puerto Rico, a state of emergency has been declared, activating the National Guard as the U.S. territory prepares the storm, which the governor on Tuesday called unprecedented. "This is the time to take action," the governor said Tuesday. 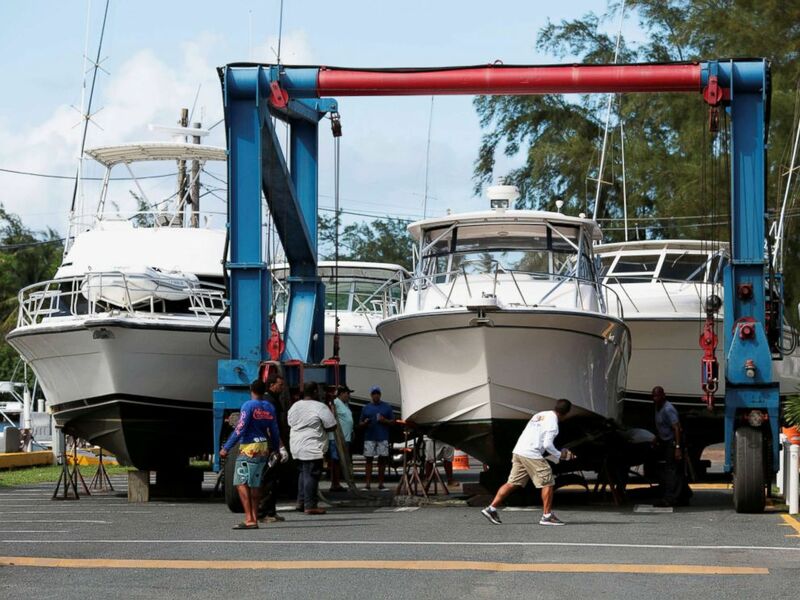 Workers put boats on dry docks in preparation, as Hurricane Irma, barreling towards the Caribbean and the southern United States, was upgraded to a Category 4 storm, in San Juan, Puerto Rico, Sept. 4, 2017. 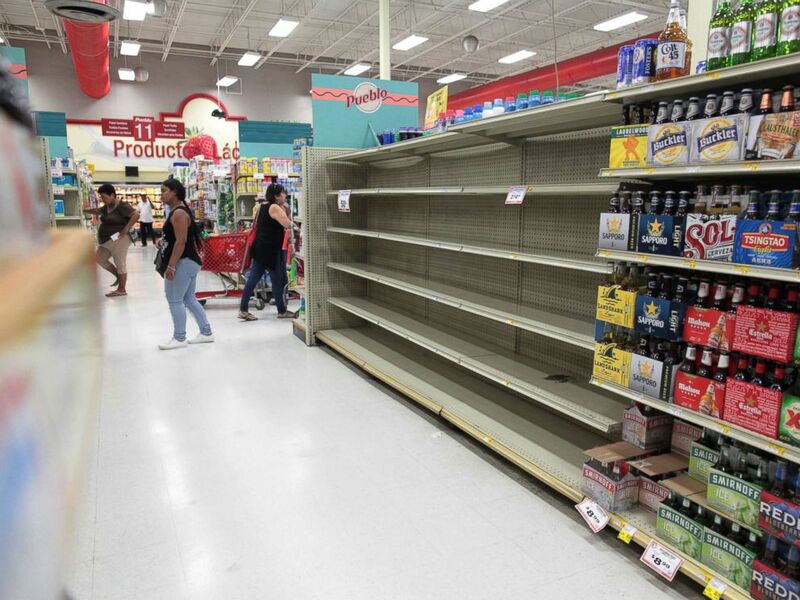 Customers walk near empty shelves that are normally filled with bottles of water after Puerto Rico Governor Ricardo Rossello declared a state of emergency in preparation for Hurricane Irma, in San Juan, Puerto Rico, Sept. 4, 2017. Héctor Pesquera, the superintendent of the Puerto Rico police, said at least 14 hours of wind and rain is expected, calling the storm more dangerous than Hurricane Harvey, which made landfall in Texas Aug. 25 as a Category 4 storm. The governor has canceled classes for Tuesday and declared a half-day of work. ABC News' Ginger Zee, Gio Benitez, Max Golembo, Dan Peck, Erin Dooley and Josh Hoyos contributed to this report.